It was a year last week that I became the owner of Harry, my Cob cross gelding. When I look back over that time, I cannot believe how much has changed. I remember when I used to struggle even to lead him and my friend saying to me, that one day I would look back at myself and laugh. Well, I don’t exactly laugh, but I can look back with a smile, but at the time, near to tears with frustration and embarrassment, I felt like the biggest failure in the world. Our relationship has truly blossomed, a cliché perhaps, but that is how I picture it, growing and spreading, blooming with trust and mutual understanding. I believe one of the significant events which helped lead us to this happy state was when Harry moved to a new home. The decision to stay where we were or to move took weeks in the making. I felt very guilty thinking about the inevitable stress that moving Harry would cause him, but I also knew he would be much happier moving to a grass livery where he would be living outside all of the time. I know some horses adapt to being stabled and my friend has a horse she says positively asks to come in, but Harry always preferred to be outdoors, becoming anxious in his stable. There was also the friend factor. He was living with three other geldings, but although he seemed quite friendly with one in particular, I wasn’t sure how well he got along with the other two. At times however, when they were all grazing nicely, I would feel a terrible guilt at separating them. By far the biggest fear factor for me when considering moving Harry was the transportation. Harry had never in his life been loaded onto anything. I rode him the short distance to where we were now and before that he was living where he had been born. I was filled with thoughts of loading disasters of ever increasing magnitude, injuries to horse and humans and of course, the dreaded Humiliation. And that’s when it struck me. Most of the time when I pictured loading Harry, and how badly I thought it would go, it was my fear of failure, or rather perceived failure that dominated my thoughts. There it was again. Ego had once more reared its ugly head. I did not want to appear inept, or the inexperienced novice I was. Of course, I was concerned for Harry’s well-being as well, but I realised I did not want people around to witness another of my failures. I tried to quiet my ego by focusing on Harry and his needs, not my perceived and shallow ones. I tried to communicate with Harry by way of visualisation, where we would be going and the lorry he would travel in. I tried to tell him, that it would be stressful, but only for a short while. The day of the move, I lead Harry up to the yard where we were to wait for our transport. From time to time Harry would turn and look toward the driveway, as if looking out for the lorry. When the taxi arrived, I explained that Harry had not been loaded before and I was not sure how this would go. As the driver maneuvered the lorry into position, I untied Harry and turned him toward the transport. To my absolute amazement, and shame at once again underestimating this beautiful horse, he walked calmly and nicely up the ramp. He paused once, as if to take a last look around, before continuing up the ramp to reach the hanging haynet. My anxiety about this move would have been a lot less if I had not allowed my ego to muscle in and try to dominate a situation where all I should have thought about was Harry. We travelled the relatively short journey to our new home where, Harry, the horse who would not be lead anywhere, calmly walked with me across the field, into his new paddock, put his head down and began to graze. Stacey Chamberlain is the proud owner of Harry, a 14.2hh Cob x Dales pony. 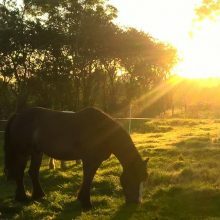 Stacey has always been a lover of horses and indeed all animals, but only experienced the privilege of horse ownership at the age of forty. From riding at a young age and viewing horses in the traditional equestrian sense, Stacey has learnt that her previous views are flawed. Stacey and Harry are now embarking on a new and growing friendship. A journey Stacey shares through her personal narrative. Stacey works as a dog walker and home boarder at her home in Leicestershire where she lives with her family and her own two dogs.